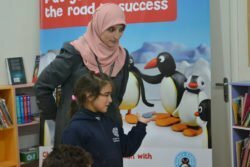 Exactly three months after Early Learning Centre Ltd became the Pingu’s English Master Licensee for Palestine, Mrs. Wesam Dalba Salhi has announced that their first unit licensee children have already started to enjoy learning through Pingu’s English engaging methodology and learning materials. In addition to developing their English language skills, Pingu’s English provides valuable lessons in socialization, numeracy and computer skills through a fun and engaging syllabus. Already a well-loved character with children all over the world, Pingu’s English has proved just as popular with the kids in Palestine, interacting with his adventures through a range of resources that include online games, books and flashcards. Palestinians in general place great importance on education. Not only as a means to increase employability and standards of living but also as part of the Palestinian culture. Through the work of Early Learning Centre and Pingu’s English, young Palestinians have access to learning opportunities that transform lives, building foundations for a brighter future. 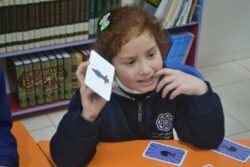 According to Palestinian Central Bureau of Statistics, 3,220 Kindergartens were operating throughout the West Bank, East Jerusalem and Gaza Strip in 2015, providing enterprising educators with huge scope for investment in the education and development in Palestine. Early Learning Center Co. Ltd (ELC) is located in the center of Ramallah, one of the most wonderful cities of Palestine and a pivotal academic and economic hub. As the Master Franchisee of Pingu’s English for Palestine ELC are looking forward to leading the early learning sector in Palestine especially in the area of English language learning with Pingu’s English. Master franchise business opportunities are available for Pingu’s English worldwide. Please call +44 (0)20 8687 6104, email opportunities@pingusenglish.com or visit www.pingusenglish.com for more information. Pingu’s English offers an array of creative learning activities and exercises using high quality, multimedia materials and teaching resources for early education. Each student will take advantage of DVDs, study books, song and story books with CDs plus interactive online learning materials developed by leading English language and child education specialists. Students will also use an activity pack which includes supplementary materials such as character figurines, coloring materials and friezes. There are also extensive teaching resources to assist teachers with each child’s learning and development. About HIT Entertainment. HIT Entertainment is one of the world’s leading children’s entertainment producers and rights owners. HIT Entertainment is a division of Fisher-Price. HIT’s portfolio includes properties, such as Thomas & Friends, Barney, Bob the Builder,Fireman Sam, Angelina Ballerina, Mike the Knight, Pingu and Rainbow Magic. Launched in 1989, HIT’s lines of business span television and video production, content distribution, publishing, consumer products licensing, digital media, and live events and has operations in the UK, US, Canada, Hong Kong and Japan. For more information, visit www.hitentertainment.com.